"What costume are you going to wear?" As Halloween approaches this question is being heard throughout most schools, offices, and homes. The deciding may be one of the harder choices for some. This decision can be difficult for a lot of people. Should I be a werewolf, should I be a princess, should I be a zombie cheerleader. There are so many difficult decisions to make. Which mask are we going to put on for this holiday? Do we want to be scary, do we want to be pretty, or do we want to be funny? It all depends on what mask we decide to put on for a day. Do these masks really represent the roles that we adopt? If we are expected to act one way in a certain role, does that mean we are going to act as is expected of the mask we put on? We may use all of these questions to make the final decision on what costume we want to wear. 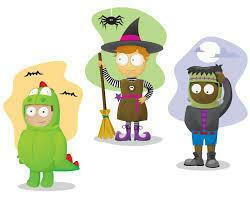 Picture this - A family of 3 young boys is that having trouble coming up with ideas on what mask to wear for Halloween. They have discussed it over and over again and just can't seem to find the right costume/mask to spike their interest. The roles we take on in our family can help influence what we decide to choose as a representation of ourselves in a costume. The 10-year-old boy wakes up in the morning with a great idea. “I'm going to be Superman for Halloween!” This could be the role that he's taken on within the family. His role in the family may be “the good son”. The “hero” may act responsible, respectful, and successful in school. Superman may have some of the role characteristics of the “hero” such as capable, trustworthy, and strong. To feel comfortable in the family unit, he may just want opportunities to play or have the permission to make mistakes. If the boy fits into the family role, then Superman may be the perfect mask for him to wear on Halloween. The next day his 8-year-old brother wakes up and decides he wants to be a lion. Specifically, he wants to be Simba from The Lion King. Maybe it's because his role in the family is the “scapegoat”. In the beginning of The Lion King, Simba, is blamed for the death of his father. If the boy has taken on the “scapegoat” role he may come across as rebellious, wild, and tough. The fact is, he may feel rejected by the family, misunderstood, hopeless. Sometimes he may just want some supportive confirmation. If he feels he is in the “scapegoat” role of the family, Simba may be the perfect costume for him. The 3rd brother, a six-year-old boy, is excited to finally make a decision. He screams across the house, “I want to be a clown!” Once again we can look at the different roles we may take on within the family. This little man has taken on the role of the “mascot.” His attitude might be funny, carefree, lighthearted, and lovable. Dressing up as a clown could be the perfect costume to fit the “mascot” role of the family. Although his attitude may be fun and carefree but on the inside he can often feel needy, dependent, or insecure. He may just want to be taken seriously every now and then. But for now, let’s help the clown have fun! No matter what costume we decide to choose to dress up in, they all have one thing in common. No matter what costume/role we take on, in any environment, the basic core that they all stem from, is the unique individual, ourselves.